Albert van der Sel : Sinus and Cosinus functions. In the series: Note 4. This note: Note 4: The Sine and Cosine functions. "linear equations" in the form of "y=ax+b", then it's highly recommended to read Note 2 first. then it's highly recommended to read Note 3 first. In fact I am sure that this note "works", if you are at least at the level represented by notes 2 and 3.
and some important "trigonometric functions" like the "sin(x)" and "cos(x)" functions. Yes, we are going to explain those functions here, so that you are able to use them, and understand the theory. 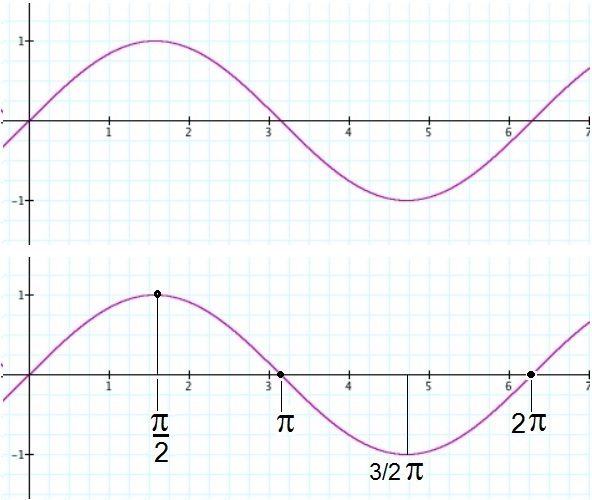 exibits a "wave-like" nature, which can be expressed mathematically as sine functions. or making of pure musical notes with instruments, the vibration of snares etc.. etc..
can also be expressed by a sine function. There are many excellent pictures and animations on the Internet, but they are not always free and in the public domain. However, the simple picture in figure 1 is. And it will do nicely. a line on a sheet of paper. This paper moves in a uniform (constant) speed. let it go. It will start swinging from one side to the other opposite site. Now, what is drawn on the paper, is a great example of a sine function. it's velocity decreases, until it reaches it's maximum displacement where the speed is "0", and then the motion is reversed. The animation in figure 2 is instructive too. Here you see a uniform circular motion. The object in "orbit"
moves with a constant velocity around the center of a circle. Note that there is another point too, moving along the vertical axis. mimics the movement of a pendulum. move to the right (with a uniform speed), we would get a sine wave on paper again. 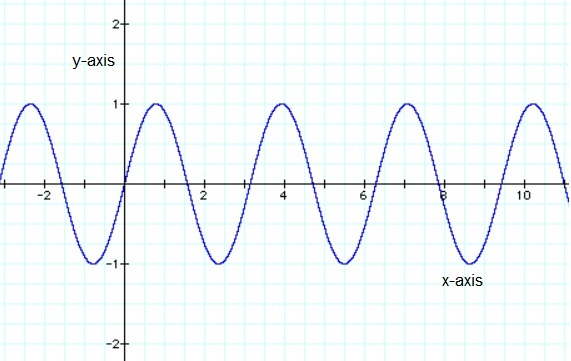 Here is an example of a sine function, plotted in the (usual) XY coordinate system. Figure 3. An example of a sin function. if the frequency was much lower, there was more distance between the peaks and crests. plot the functions in the (usual) XY coordinate system. should be plotted against "time" (t). pendulum with respect to time. 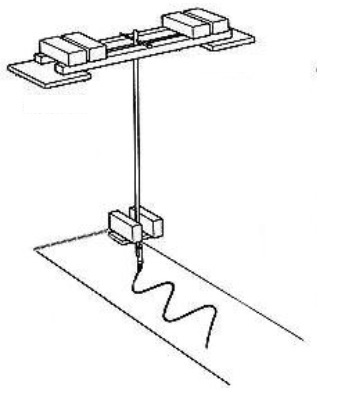 The figure on the paper really tells us, where the pendulum was, at a certain time. and the "x" of the "x-axis" with "t" of time. but it could also have been, in a manner of speaking, by the "v" and "w" axes. There is no fundamental difference here. the usual integers as 1,2,3 etc.. However, when talking about sin() and cos() functions, the number "π" plays a very important role. The two figures below, are equivalent. But, in the lower figure, I explicitly showed "π" as well. The number "π" will be explained in section 2. 2. 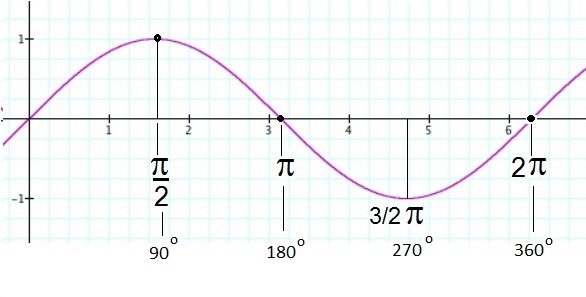 Functions of an angle, and what's π anyway?. which we simply will write as "2πr" (leaving out the multiplication symbol). 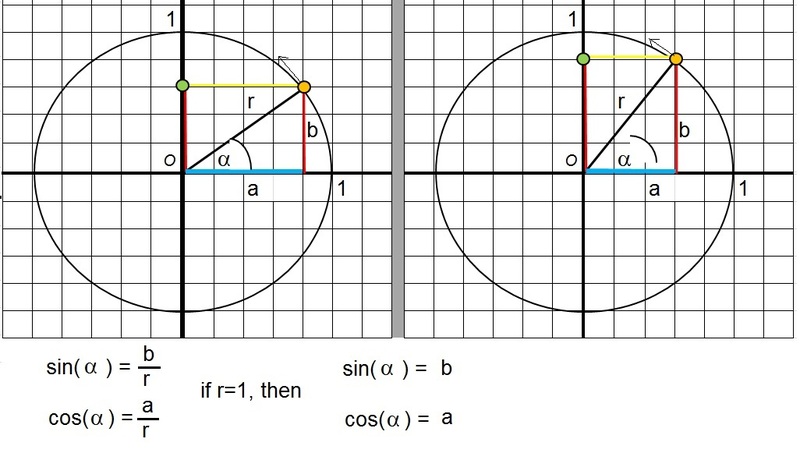 Note that if "r" is the radius, then "2r" is the diameter of a circle. then so would the circumference. If r is decreased, then so is the circumference. However, although the "formula" 2πr is not really complicated, it sure is not easy to proof! that the ratio of "circumference : diameter" was constant, no matter what length of r was chosen. of π is very close to 3.14, but that's only an approximation. then the circumference = 2 x 3.14 x 2 = 6.28 x 2 = 12.56 m.
In many cases, like the simple example above, the approximation of "3.14" is good enough. a higher precision is required. actually never ends, and you can try to be more and more precise, without end. Today, high-end supercomputers have calculated the value of "pi" to many, many, thousends of digits (behind the "dot", or "comma"). Although a circle (or sphere) is a common object, it really stands out in having "complete symmetry". and the center, which will always splits it in two equal parts? We have seen that a sine function emerges "naturally" from the oscillation of a pendulum. that they can be described by a sine (or cosine function), or a "sum" of such functions. By the way, in a moment we will see that the sine and cosine are actually equal, except for a phase difference. What ever that is (the phase difference), we will learn about that in a moment too. However, first we need to review a (sort of) "formal definition of the sine and cosine functions. you get the blue piece of line (along the x-axis). Let's call that piece of line "a". When you "project" r on the y-axis, you get the red piece of line, but this time shown on the right. Let's call that piece of line "b". Note that we have right-angled triangle, enclosed by "r", "a" and "b". Note also that we have an angle, let's call it "α", between "r" and "a". Note that "an angle keeps the same value", no matter how much we "inflate" the triangle. If you say: "I still don't see the connection with the sine graph examples...", then I don't blame you. as we have shown in figure 2. That is, the green dot mimics the pendulum movement, en swings along the y-axis, up and down, just as a pendulum would do. Actually, as we saw in figure 2, it's the orange dot which moves along the circle with a uniform speed. This makes the projection (the green dot) "act" like a pendulum. Every time the green dot (or orange dot) changes position, then the length of a or b changes too. it's maximum. Then the green dot starts moving downwards, en b=sin(α) get smaller. all the way "down" to "-1". Then, the green dot starts moving up again etc.. etc..
Now, please take a look again at figure 4 (and you may ignore the values on the x-axis for a moment). Would't you agree that the value of the length of "b", is reflected in the curve, as time passes, "moving"
from the value "0" to "+1" then moving to "0" again, all the way down to "-1", and then starts "to climb" again etc.. etc.. Since sin(α) = b (if r=1), we also may say that we have a curve (or function) notated by "sin(α)". But what do have on the x-axis on such a curve? Angles?. Yes that is true, so we have for example 30 degrees, 90 degrees etc.. However, mathematically, we often have the numbers 1,2,3 etc.. on the x-axis. So is that a conflict? No, you may list a (continuus) range of angles on the x-axis, from 0 degrees to 360 degrees. Or, you may use the usual numbers. However, that does not look "very nice", but it is still correct. This is why people often arrange fractions of "π" along the x-axis, as is shown in figure 4, the lower figure. In a moment, more on this. Now what about "a"? Above, we have seen the story of "b". Indeed for "a", a similar story holds. This time, you need to imaging a "green dot" going continuously from left to right. However, there is a small "phase difference" between both stories. If the green dot is in the Origin, then b=0, but a is at it's maximum, namely "1". This is so since "r"
lies completely along the x-axis, and thus the blue line segment "a" coincides with "r". then "a" is 0 (while b=1). Since a=cos(α), the sine and cosine functions are identical, but the cosine is a small phase "ahead"
compared to the sine function. I still have to explain the values along the x-axis. Since we started by using the sine of an "angle", like "sin(α)", you may ofcourse divide the x-axis in degrees (from 0 to 360). You may also divide the x-axis using the ordinary numbers like 1, 2, 3 etc.. But where is the "match"? This will be explained in section 2.3. 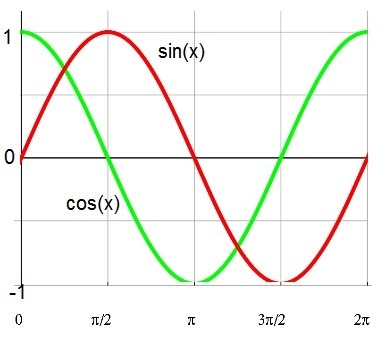 Note that figure 6, shows us just one period of both the sine and cosine functions. will repeat the "period" over and over again. upward, counterclock wise. Ofcourse, that dot follows the circle. There comes a brief moment, where the "arc"
length of the arc increases continuously. It happes when α is about 57.3 degrees. The remarkable thing is, is that if we perform "π x 57.3 = 3.14 x 57.3" we get 180 degrees. (remember, &960; is about 3.14). Expressed in such way, by agreement, people often say that at 180 degrees, we are at π radians (rad). - we rotate 90 degrees counterclock wise, we are at 90 degrees or π/2 (or π/2 rad) . - we rotate 180 degrees counterclock wise, we are at 180 degrees or π (or π rad). - we rotate 270 degrees counterclock wise, we are at 270 degrees or 3/2π (or 3/2 π rad). - we rotate 360 degrees counterclock wise, we are at 360 degrees (or 0 degrees) or 2π (or 2π rad). Let's now plot the standard sine function, using a few numbers, degrees, radians on the x-axis. In figure 7, we have three different "representations" of the possible "x-values": numbers, degrees, radians. put in π/2, π, 3/2 π, and 2π too. We also know that these corrspond to 90, 180, 270, and 360 degrees (in that order). put in π/2, π, 3/2 π, and 2π too. We know that these simply corrspond to 90, 180, 270, and 360 degrees (in that order). As the last "standard" "trigonometric function", we will introduce the "tangent()" function here. I am sure that it will amaze you, how completely different it "looks", compared to the "nice" periodic sine and cosine functions. Please remeber that the definitions refer to a right-angled triangle, enclosed by "r", "a" and "b". Otherwise, if needed, please take a look at figure 5. again. tan(α) tends to diverge to an infinite high value. Figure 8. Standard tangent function. Note that, for example if x=π then sin(π) is "0" and thus tan(π) is "0". 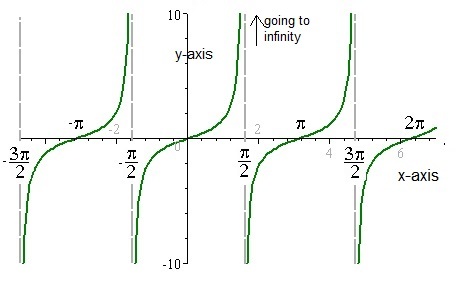 However, if x=1/2 π, then cos(1/2 π) = "0", meaning that tan(1/2 π) is "not defined", meaning going to infinity. 3. 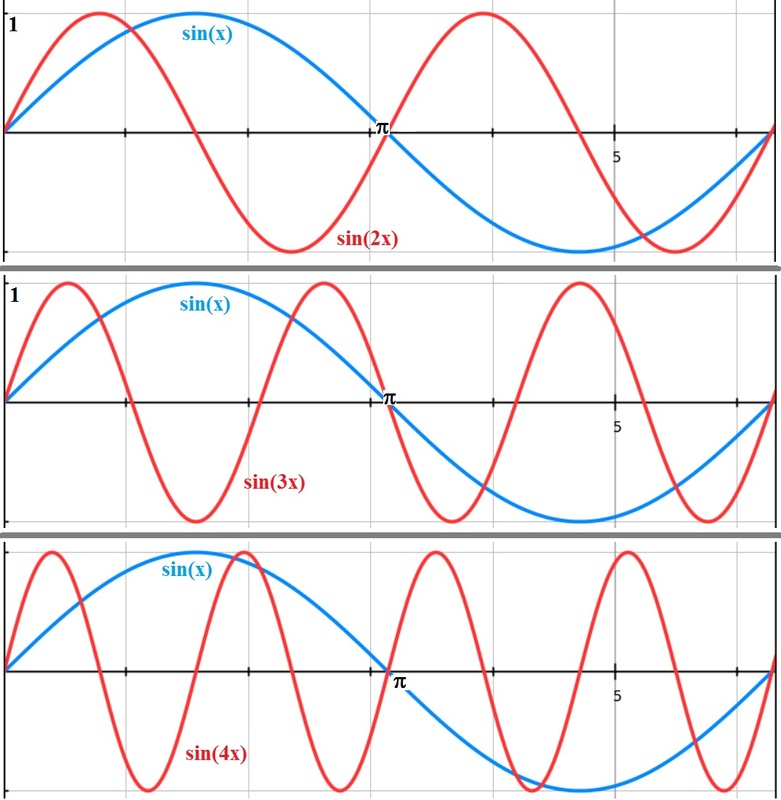 The sine function (or cosine) with other "frequencies". What would we see if we investigate functions like f(x)=sin(2x), or f(x)=sin(3x), or in general, f(x)=sin(nx)? I will make it plausible, that if "n" increases, the function will "oscillate" faster. Figure 4 shows you the standard f(x)=sin(x) function. For x=π, then f(x)=sin(π)=0. You can also check that with figure 4. Now, suppose we have the function g(x)=sin(2x). Now, already for x= 1/2 π, then g(x)=sin(2 * 1/2 π)=sin(π)=0. So, already for "x is half pi", we have that g(x) is "0". It seems that g(x) ocillates twice as fast as the standard sin(x). This will be explained more thourougly in the "task" below. Now take a look at figure 10. Here we see the functions sin(2x), sin(3x), and sin(4x) compared to sin(x). Figure 10. The sin() function with different "frequencies". How fast a sin(nx) function ocillates, is expressed in how many "periods" fit in the interval [0,π]. The "more" periods fit, it also said that the higher it's "frequency" is. Maybe this task looks difficult at first sight. No, it's really quite easy. First, I am not going to plot anything here. I will only use a small bit of logic. I say that "sin(2x)" is simply 2x denser in peaks and crests, compared to the standard "sin(x)". You know, for example from figure 4, that sin(x) has it's first peak at π/2, and it's first crest at π. For sin(2x) those first peaks and crests are happening much "earlier". Look at sin (2 x π/4) = sin(π/2). That means, if we try π/4 for "sin(2x)", we get the same as sin(π/2). So, sin(2x) gets it's first peak already at "π/4", compared to sin(x) which has it's first peak at π/2. Similar reasoning holds for the other peaks and crests. will fit in one period of sin(x). So, what would happen with sin(3x)? Then 3 periods of sin(3x) will fit in one period of sin(x). Thus, if you would look at sin(n x), where n is a whole integer, the larger n is, the faster the function "ocillates". And "n" periods of sin(n x) will fit in the period of the standard sin(x). It's completely the other way around if "n" would be a fraction. are more "stretched" compared to the standard "sin(x)" function. For example, 3 standard "sin(x)" periods, will fit into one period of "sin(1/3 x). Now what about the "3" in "y = 3 sin(2x)"? Just as with any other function, this has only an effect on the "amplitude" or values of y. It does not have an effect on the rate of oscillations (or periods). For example, sin(x) (or sin(2x) for that matter), has a maximum value of "y=1", for some values of x. The "3" in "y = 3 sin(2x)", simply means we multiply every "y" with 3. So the max value of "y = 3 sin(2x)" is "3" (instead of "1"). In the end, it's very simple to determine how a function like "y = A sin(Bx)" would generally look like. Suppose we have a right-angled triangle, enclosed by "r", "a" and "b", just like in figure 5. Task: Calculate sin(α) and cos(α). Ofcourse, if you have a calculator, you could have typed in sin(30) and cos(30), and obtained the result immediately. the graphs, by finding the "y-values" at x=30 degrees. Task: Calculate sin(α) and cos(α). Also, determine the angle α between r and a.
since we know the values of a, b, and r.
the inverse of the sine function. But, we have not seen those inverse functions yet. So, we are not going to use that method, yet. So, what now? Having a accurate graph of the sine function, then where y=sin(x)=0.8, we find an angle of about 54 degrees. Or, there also exists tables which lists the sin, cosine, tangent, for every single degree from 0 to 360. Is that old-fashioned? Absolutely, but it works. but we know the angle between "a" and "r", the we can calculate "a" from the cosine of the angle. See figure 9. Suppose we know "r", "b", and the angle. But not "a". Can we still derive it? Figure 9. Standard tangent function. 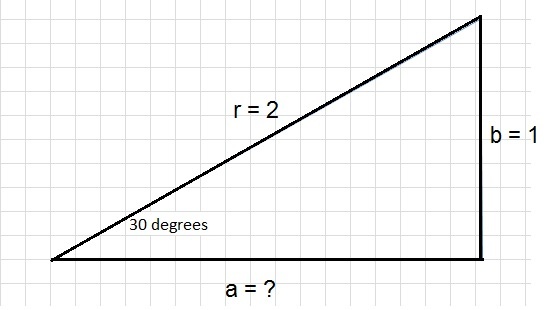 The angle α between the side r and a, is 30 degrees. We need to find "a". So we have found the length of side "a", since we knew "r" and the angle between "r" and "a". You might also say: I just use "Pythagorean theorem" here. Yes, that works too. If you know the lenght of 2 sides of a right-angled triangle, you can always calculate the unknown one. Any time, when I think some new topic would fit in this note, I will place it in this section. 5.1 The "Pythagorean theorem" works here too. If you would take a look at figure 5 again, you see that the radius "r" sweeps along the circle. And we may eliminate the r2 on both sides of the "="
I will refer to that equation in a later note, so that's why I already mention it here. 5.2 The sine or cosine functions expressed in time and angular velocity. For those interested in applications in physics, the following might be of interest. So, like always up to now, we usually talk of a function of the variable "x". If you then look at sin(nx) or cos(nx) graphs, it seems as if they are like a "snapshots" in time. that you can see in figure 2. So, the displacement of a certain point, varies with time, and that displacement thus can be described by sin(nt). For a certain fixed point (but it can be any point), we know that it's displacement along the "y-axis"
can be described by sin(nt). Note that we focus here on the "sine", but we could just as easily have choosen "cosine". The "n" in "sin(nt)" is tied to the property of how fast it "oscillates". We are almost there! It's only logical to try to "link" that "n" to the physical properties of that system. Displacement along y = f(t) = sin(nt). Displacement along y = f(t) = Asin(nt). The value "n" must have some sort of a direct link with the "frequency", as we have seen in a former section. Displacement along y = f(t) = Asin(2πf t). If you look at figure 2 again, the point on the circle, has a "uniform" motion, with a constant speed. Suppose the "period" of completing one full circle is "T" seconds. The circumference (or distance) of completing one full circle in "T" seconds is "2πr". If T is short, then the frequency is high. And, if T is long, then the frequenct is low. So, suppose T=5, then it takes 5 seconds to complete the whole cicle once. Note that 1/5=0.2. Suppose T=0.2, then it only takes 0.2 seconds to complete the whole cicle once. Note that 1/0.2=5. for the particle that does the circular motion, does in a certain time. Displacement along y = f(t) = Asin(ωt). The next note is a super quick intro on how to differentiate, and differential equations.